There isn’t an extended history to High Standard’s revolver line, like there is to their line of semi-automatic target pistols. They didn’t design their first revolver, the Sentinel, until 1955, probably at the behest of Sears, which was a large shareholder in the company. 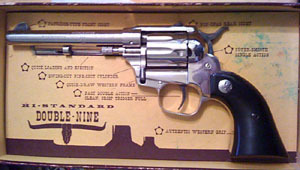 The Double-Nine, a double-action nine shot Western style revolver, first appeared in 1958. It had an aluminum frame, a rebounding hammer, and a 5½ inch barrel. They were available in both blue and nickel finish , though I have seen far fewer in nickel than in blue. Early grips were white or black plastic, and later fake stag was available. A few rare guns have checkered black plastic grips. Sears sold the gun as the J.C. Higgins Ranger or Model 90, and later also as the Ranger De Luxe. High Standard also made western style revolvers for Western Auto and Kroydon Arms. W-100. The first Double-Nine series was called the W-100. W-101. After about a year, in early 1959, the ejector rod latch was modified slightly, as was the frame to accommodate it. W-102. In 1960, for the W-102 series, a return spring was added to the ejector rod. On the earlier models, if you didn’t remember to manually retract the ejector into the cylinder before closing the cylinder you would put a nasty scratch on the left side of the frame. The “Longhorn,” “Posse,” and “Natchez” models were first manufactured in 1960, with shipments beginning in September. The Posse did not have the underlug on the barrel to contain the cylinder release. 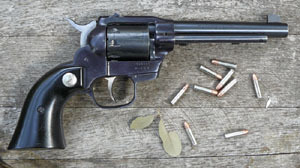 The “Longhorn” was sold with 4½, 5½, and 9½ inch barrels; the “Posse” had walnut grips and a 3½ inch barrel; and the “Natchez” featured a birds-head grip and a 4½ inch barrel. Sears also sold versions of the 9½ Longhorn, Natchez, and Posse. The W-102 series of the Double- Nine was only in production for a few months before it transitioned to the W-103, whereas the W-102 Longhorns were in production for about a year. W-103. This series appeared arround March of 1961. The changes were mostly internal. The ejector latch housing was stamped instead of machined. W-104. This series appeared around April of 1962 and featured internal changes only. W-105. In early 1970, more internal changes were made. The “Hombre,” “Durango,” and “Marshal” models were introduced. Walnut grips became standard. The Marshall, like the Poss,e did not have the underlug on the barrel to hold the cylinder release. 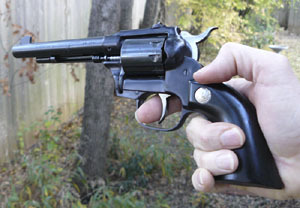 The 1970 Hombre had a 4” barrel, whereas later versions had a 4.5” barrel, as did all the Durangos. High Standard also made a copy of the Double-Nine from 1971 through early 1975 that was called the NATO 49er. It had the aluminum frame of the W-105 series guns, rather than the steel frame of the W-106. W-106. The W-106 series was introduced in 1971 and had a steel frame that could handle magnum cartridges. 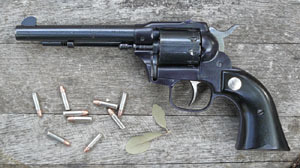 The first Double-Nines were made with interchangeable cylinders (.22 long rifle and .22 magnum). The firing pin was moved from the hammer to the frame, and the guns were available with an adjustable rear sight. The “High- Sierra” was introduced in early 1973, with an octagonal barrel, gold plated trigger guard and grip frame, and interchangeable cylinders. (The earliest version was not marked “High-Sierra” and was produced for less than a year. Some of them came in a box marked Longhorn, but with an applied sticker that said “Double-Nine Convertible.”) The aluminum-frame W-105 series continued production in parallel with the steel-frame W-106. The Double-Nine shown here was the first gun I ever bought. It is a W-104 series, made in 1968. I bought it in 1971 at a pawn shop in downtown Houston for $39.95--it came with a holster. The gun originally had some really ugly fake-stag plastic grips. I quickly sought out the black grips which have been on the gun ever since. This is still my favorite .22 pistol. I also own a High Standard semi-auto target pistol, but I can shoot my revolver pretty much interchangeably with it--they are both equally accurate. My experience with other .22 revolvers has not been as good. For instance, it is difficult to find a Ruger Bearcat where all the chambers are accurate. John J. Stimson, Jr. tells me, however, that the factory acceptance standards for the revolver line was not as high as for the automatic pistol line-- the autos were required to fire tighter groups to pass inspection. High Standard claimed that with the counter-bored cylinder the gun could be dry fired without damage. I have accidentally dry fired mine a number of times over the years with no noticeable damage to the cylinder or firing pin, though I still don’t recommend dry-firing if you can avoid it. My gun has seen a lot of wear and tear. I foolishly left it in the trunk of my car for quite a while and the cylinder got some rust on it. Before I took these pictures, I carefully touched up scratches on the frame with Birchwood Casey Aluminum Black and retouched the cylinder and barrel with Birchwood Casey Super Blue. The old gun looks pretty darned good now! Double Nine serial numbers were in the same series as the Sentinel through 1971. M series guns actually began shipping in December of 1971. This data provides the known highest serial number produced in a given year--but the guns were rarely shipped in serial number order. Production from 1978-1984 was at the East Hartford location. For more detailed information and for earlier revolvers see www.histandard.info. The Ranger was made by High Standard for Sears Roebuck Company from 1958 through 1963, built on the same aluminum frame as the Double-Nine. The cylinder of the Ranger was fluted in a distinctive pattern and the trigger, hammer, and grip frame were nickel plated, whereas the rest of the gun had a blued finish. All Rangers were fitted with a 5-1/2 inch barrel. There were three versions. The first version (Sears ID number 583.990), marked “Ranger” on the barrel, was a W-100 series gun with no return spring for the cylinder ejector. 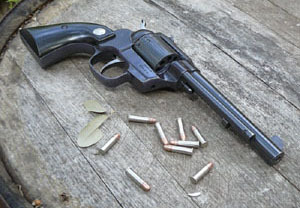 The second version (Sears ID number 583 .991), marked “Ranger” on the barrel, was a W-101 series gun, which likewise did not have a return spring for the cylinder ejector. The third version (Sears ID number 583.992), marked “Model 90” on the barrel, was a W-103 series gun with a return spring in the cylinder ejector. These guns all featured checkered black plastic grips with a medallion showing a saguaro cactus inset with the skull of a steer. The Ranger is a relatively scarce gun. Hi-Standard pistols & Revolvers: 1951-1984, by James Spacek. Self published, Cheshire, Connecticut: 1998. “J.C. Higgins Ranger” by Marcia Mighell. High Standard Collectors’ Association Newsletter, Vol XVIII, No 2, June 2009. Copyright 2008-2016 by Ed Buffaloe. All rights reserved. Please contact the author if you can provide good photographs of High Standard (or Sears) revolvers not shown here.